Need of Auditor: All the companies registered under the Companies Act, 2013 or any previous Company law, whether public or private and whether having a share capital or not, are required to maintain proper books of accounts under the provisions of section 128 of the Companies Act, 2013. Companies have also to get their Books of accounts audited as required under section 139 of the Act. Audit is an examination of accounting records undertaken with a view to establish the correctness or otherwise of the transactions reflected therein. It involves an intelligent scrutiny of the books of account of a Company with reference to documents, vouchers and other relevant records to ensure that the entries made therein give a true picture of business Therefore, there is need to appoint Statutory Auditor. WAYS OF CHANGE IN AUDITOR: These points will discuss in next article. BM stands for Board Meeting. Section 139 of CA-2013 governs the aspects of appointment of auditors. Section 139 of the Companies Act, 2013 deals with all the cases, circumstances with respect to appointment of auditors and therefore, it is a complete code in itself with respect to appointment of Auditors. Corresponding section of 139 was 224, 224A, 619 of CA-1956. Audit is useful only if it is conducted by some independent and qualified authority. The auditor must possess requisite qualifications and must act in an independent capacity. I will discuss the qualification/disqualification of auditor in separate article. Forms for appointment of auditor are ADT-1. Role of Audit Committee: As per sub-section (11) of Section 139 of the Act, where a Company is required to constitute an Audit Committee under section 177, all appointments, including the filling of a casual vacancy of an auditor under this section shall be made after taking into account the recommendations of such committee. Process along with flow charts for appointment of auditor in all the conditions will share in a separate article. As per section 139(6), the first auditor of all types of companies, except a Government Company, shall be appointed by the Board of Directors within 30 days from the date of registration of the Company. Before the appointment of auditor is made, the written consent of the auditor to such appointment, and a certificate from him that if the appointment, if made, it shall be in accordance with the conditions as may be prescribed, shall be obtained from the auditor. Certificate shall also indicate whether the auditor satisfies the criteria provided in section 141. Company shall inform the auditor concerned of his or its appointment and there is no need to file ADT-1 for appointment of the First auditor. Tenure: First Auditor appointed by Board shall hold office till the conclusion of the first annual general meeting of the Company. Remuneration: Section 142 of the Act prescribed that Board may fix remuneration of the first auditor appointed by it. The remuneration will be in addition to the out of pocket expensed incurred by the auditor in connection with the audit of the Company and any remuneration paid to him for any other service rendered by him at the request of the Company. Resolution involved: Appointment of First auditor by Board Resolution whether in the Meeting of Board of Directors or by Circular Resolution. Form Involved: There is no need to file ADT-1 for appointment of the First auditor. Section 139(6) also provides that in the case of failure of the Board to appoint the first auditors within 30 days of incorporation of the Company, it shall inform the members of the Company, who shall within 90 days at an extraordinary general meeting appoint the first auditor and such auditor shall hold office till the conclusion of the first annual general meeting. As states above, the duty of the Board to inform members about their failure to appoint first auditor, triggers immediately on expiry of the 30 days period whereas the duty of the members of the Company to appoint first auditor, triggers immediately on receipt of information of non –appointment by the Board. The members, shall within 90 days from the date of information being sent to them, appoint auditor and such auditor shall hold office till the conclusion of the first annual general meeting. The Board of Director will recommend the name of auditor or auditor firm to Shareholder. Shareholder in after discussion EGM will appoint the auditor by passing of Ordinary Resolution. Remuneration: Section 142 of the Act prescribed that the remuneration of the auditor of a Company shall be fixed in its general meeting or in such manner as may be determined therein.. The remuneration will be in addition to the out of pocket expensed incurred by the auditor in connection with the audit of the Company and any remuneration paid to him for any other service rendered by him at the request of the Company. Resolution involved: Appointment of First auditor by EGM by passing of Ordinary Resolution. The First auditor shall be appointed by the Comptroller and Auditor General within 60 days from the date of incorporation. The Board of Director take note of the same in the Board Meeting held after such appointment. Further, all appointments made by the C&AG are required to be intimated by the Company to auditor. Remuneration: Section 142 of the Act prescribed that Board may fix remuneration of the first auditor appointed by it. Resolution involved: Appointment of First auditor by passing of Board Resolution whether in the Meeting of Board of Directors or by Circular Resolution on the recommendation of the Comptroller and Auditor General. As per section 139(7), In case the Comptroller and Auditor-General of India does not appoint such auditor within the said period of 60 days, the Board of Directors of the Company shall appoint such auditor within the next 30 days (60+30=90). Resolution involved: Appointment of First auditor by passing of Board Resolution whether in the Meeting of Board of Directors or by Circular Resolution. In the case of failure of the Board to appoint such auditor within the next 30 days, it shall inform the members of the Company who shall appoint such auditor within the 60 days at an extraordinary general meeting, who shall hold office till the conclusion of the first annual general meeting. 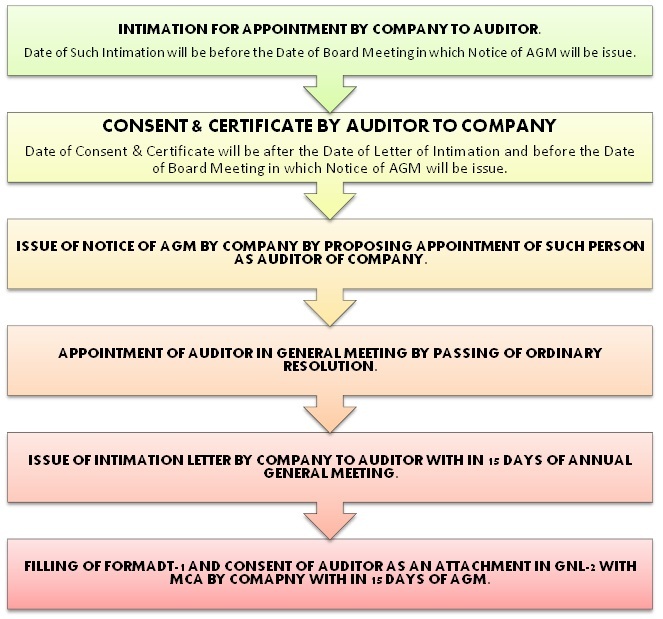 As states above, the duty of the Board to inform members about their failure to appoint first auditor, triggers immediately on expiry of the 90 days period whereas the duty of the members of the Company to appoint first auditor, triggers immediately on receipt of information of non –appointment by the Board. The members, shall within 60 days from the date of information being sent to them, appoint auditor and such auditor shall hold office till the conclusion of the first annual general meeting. Tenure: First Auditor appointed by EGM shall hold office till the conclusion of the first annual general meeting of the Company. In term of section 139(1) of the Companies Act, 2013 read with rule 3 of Companies (Audit and Auditors) Rules, 2014 every Company shall at the first annual general meeting, appoint an individual or a firm as an auditor who shall hold office from the conclusion of that meeting till the conclusion of its sixth annual general meeting (AGM). Company shall inform the auditor concerned of his or its appointment and also file a notice of such appointment with the Registrar in Form ADT-1 within 15 days of the meeting in which the auditor is appointed. Recommendation by audit Committee: Section 139(11) of the Companies Act, 2013 read with Rule 3(1) provides in case of a Company that is required to constitute an Audit Committee u/s 177, the committee, shall take into consideration the qualifications and experience of the individual or the firm proposed to be considered for appointment as auditor and whether such qualifications and experience are commensurate with the size and requirements of the Company. The committee shall recommend the name of an individual or a firm as auditor to the Board for consideration and in other cases, the Board shall consider and recommend an individual or a firm as auditor to the members in the AGM for appointment. If the Board agrees with the recommendation of the Audit Committee, it shall further recommend the appointment of auditor to the members in the AGM otherwise, it shall refer back the recommendation to the committee for reconsideration citing reasons for such disagreement. If the Audit Committee decides not to reconsider its original recommendation, then Board shall record reasons for its disagreement with the Audit committee and send its own recommendation for consideration of the members in the AGM and if the Board agrees with the recommendations of the Audit Committee, it shall place the matter for consideration by members in the AGM. Recommendation by Board of Directors: In cases where such a committee is not required to be constituted, the Board, shall take into consideration the qualifications and experience of the individual or the firm proposed to be considered for appointment as auditor and whether such qualifications and experience are commensurate with the size and requirements of the Company. The Members shall appoint the auditor in the AGM by passing of Ordinary resolution. As per section 139(1) the Company shall inform the auditor concerned of his or its appointment, and also file a notice of such appointment with the Registrar within 15 days of the meeting in which the auditor is appointed. The intimation may be given in form ADT-1. Remuneration: Section 142 of the Act prescribed that the remuneration of the auditor of a Company shall be fixed in its general meeting or in such manner as may be determined therein. Resolution involved: Appointment of auditor in Annual General Meeting and the fixing of the remuneration of the auditors shall be an ordinary business to be transacted at an annual general meeting of a Company. Company will pass ordinary resolution for the same. Form Involved: Company shall inform the ROC in Form ADT-1 within 15 days of the General meeting in which Company pass Ordinary Resolution for appointment of the Auditor. There is no need to file form ADT-1 every year. Audit Committee: The Act also provides that in case the Company has an Audit Committee, then all appointments of Auditor including filling of casual vacancy, shall be made after taking into account the recommendations of the Committee. Company shall at the first annual general meeting, appoint an individual or a firm as an auditor on the recommendation of C&AG who shall hold office from the conclusion of next Annual General Meeting (AGM). Tenure: The auditor appointed in the AGM meeting shall hold office from the conclusion of that meeting till the conclusion of next general meeting. The expression ‘casual vacancy’ has not been defined in the Companies Act. Simply stated, a casual vacancy in the office of an auditor means a vacancy caused in the office of an auditor by his death, disqualification, resignation, etc. It has been held in the case of the Institute of Chartered Accountants of India v Jnanendranath Saikia (1955) 25 Comp Cas 53, 56 (Assam) that casual vacancy is not a vacancy created by any deliberate omission on the part of the company to appoint an auditor at its annual general Meeting. Section 139(8) of the Companies Act, 2013 prescribed that the Board of Director fill casual vacancy in the office of an auditor due to reason other than resignation within 30 days of such resignation. In case of a Company that is required to constitute an Audit Committee u/s 177, the committee shall recommend the auditor to Board of Directors. Tenure: Any auditor appointed in a casual vacancy shall hold office until the conclusion of the next Annual General Meeting. Remuneration: Section 142 of the Act prescribed that the remuneration of the auditor of a Company shall be fixed by board of director. Resolution involved: Appointment of auditor due to casual vacancy by Board Resolution whether in the Meeting of Board of Directors or by Circular Resolution. Form Involved: There company is need to file ADT-1 for appointment of such auditor within 15 days of appointment. If any casual vacancy in the office of an auditor is caused by the Resignation of an Auditor, such vacancy shall only be filled by the company in general meeting convened within three months of the recommendation of the Board. It is pertinent to note that, in case of casual vacancy arising out of resignation of existing auditor, Board can only recommend appointment of an Individual or Audit Firm and the final authority to appoint such individual or audit firm as Auditor remains with the members of the Company. In case of casual vacancy arising out of resignation of the existing auditor, the board shall recommend appointment of an Individual or audit firm as auditor within 30 days of the date of casual vacancy and the shareholders shall appoint within 3 months from the date of such recommendation of the Board and the said Individual or Audit firm shall hold the office till conclusion of the next annual general meeting. Remuneration: Section 142 of the Act prescribed that the remuneration of the auditor of a Company shall be fixed by members in General Meeting. Resolution involved: Appointment of auditor due to casual vacancy by Shareholders in the extra ordinary general meeting by passing of ordinary resolution. In the case of a company whose accounts are subject to audit by an auditor appointed by the Comptroller and Auditor-General of India, be filled by the Comptroller and Auditor-General of India within 30 days of such casual vacancy. If vacancy is not filled by the Comptroller and Auditor-General of India within 30 days, the Board of Directors shall fill the vacancy within next 30 days (30+30=60). Remuneration: Section 142 of the Act prescribed that the remuneration of the auditor of a Company shall be fixed by Board of Directors in their meeting. Resolution involved: Appointment of auditor due to casual vacancy by board of director on the recommendation of the C&AG or by passing of Board Resolution in the Board Meeting in case of failure of C&AG. Form Involved: There company is need to file ADT-1 for appointment of such auditor within 15 days of such appointment. In the Companies Amendment Bill, The concept of ratification of auditor Has been deleted. First proviso to Sub-rule (7) of Rule 3 provides that the auditor appointed at annual general meeting shall be subject to ratification in every annual general meeting till the sixth such meeting by way of passing of an ordinary resolution. The act has introduced a new concept of ratification of auditors at every annual general meeting. Here ratification means formal assent of shareholders for continuance as auditors. Explanation of Rule 3- For the purposes of this rule, it is hereby clarified that, if the appointment is not ratified by the members of the company, the Board of Directors shall appoint another individual or firm as its auditor or auditors after following the procedure laid down in this behalf under the Act. Situation: If in any AGM auditor is not ratified by the Shareholders then exiting auditor shall be liable to leave its post and such vacant place of auditor in the Company will be consider as Casual Vacancy. As per explanation of rule 3 Board of Director shall appoint new auditor after following the process of casual vacancy. *There is no provision of ratification of auditor in case of government Companies because tenure of the auditor in Government Companies upto next Annual General Meeting of the Company only. a special resolution has not been passed at that meeting appointing some other auditor or providing expressly that he shall not be re-appointed. As provided by section 139(9) of the Act at any annual general meeting, a retiring auditor shall be reappointed except, in three types of cases referred to therein. The expression shall be re-appointed, postulates some action on the part of the company resulting in the auditor getting re-appointed or automatically re-appointed at the annual general meeting. It has been clarified that passing of the resolution for that purpose at the annual general meeting is essential for the re-appointment/ratifying for the appointment of the retiring auditor who is still qualified and willing to act. Till this is done, a retiring auditor cannot be said to have been re-appointed as contemplated by the section. In this view, it is not correct to say that in the absence of the resolution to the effect that the retiring auditors shall not be re-appointed; the retiring auditors shall stand re-appointed as auditors of the company. It is not mandatory to reappoint the retiring auditor even if 3 things stipulated in sub-section (9) are not attracted. The board of director may recommend any person other than retiring auditor for appointment as statutory auditor of the Company at the time of completion of term of existing auditor of the Company. Tenure: The auditor appointed in the AGM meeting shall hold office from the conclusion of that meeting till the conclusion of the sixth annual general meeting, with the meeting wherein such appointment has been made being counted as the first meeting. Remuneration: As per section 142 remuneration of auditor shall be decide by the members in its subsequent general meeting. Filing of e-form: The Company will file e-form ADT-1 with ROC within 15 days of passing of ordinary resolution in general meeting. Sub-Section (10) of section 139 stipulates that where at any annual general meeting, no auditor is appointed or re-appointed, the existing auditor shall continue to be the auditor of the company. Hence, it is clear that the retiring (existing) auditor even if not re-appointed, may still be automatically appointed if the Company fails to appoint an Auditor in place of the existing auditor. Tenure: If not auditor is appointed in AGM then retiring auditor will continue as auditor of the company from the conclusion of this AGM to conclusion of 6th Annual General Meeting of the Company subject to ratification by shareholder in every AGM. Filing of e-form: There is no need to file any form with ROC for continuation of existing auditor as auditor of the Company. 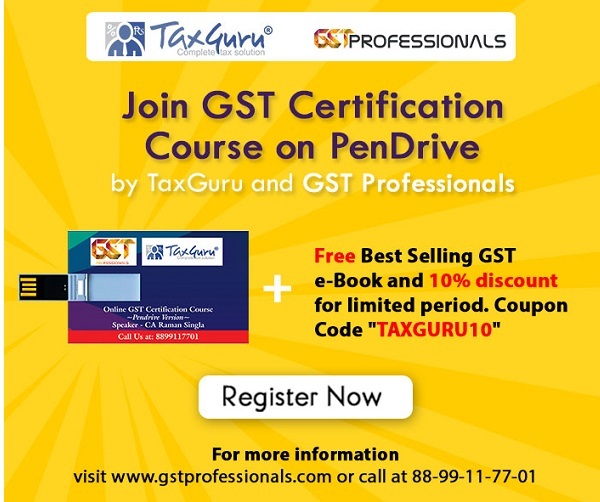 Eligibility, Qualification or Disqualification of Auditor. Disclaimer: The entire contents of this document have been prepared on the basis of relevant provisions and as per the information existing at the time of the preparation. The observations of the author are personal view and the authors do not take responsibility of the same and this cannot be quoted before any authority without the written consent of the author.